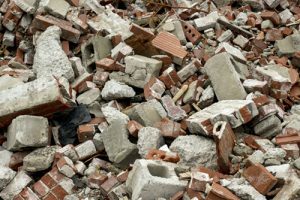 Clean rubble is a special segment of construction and demolition debris consisting mostly of unpainted concrete and block, asphalt, brick, and rock. Clean rubble is accepted free of charge at the SCISWA Landfill. Concrete with rebar, painted concrete, and mixed loads of construction and demolition debris containing wood, plastic, paper, drywall, and other demolition-type wastes are required by law to be landfilled. If you have a large construction or demolition job coming up, ask your contractor about recycling clean rubble. Check with SCISWA for help identifying recycling opportunities for these projects.